Interested in Housing, Demography, New Affordable Living? Prof. William Hynes, FAC Managing Director, will be speaking at the Vienna Housing Model exhibition in CHQ, Dublin Docklands, this coming Monday, 8th April (9:30-13:00). Vienna has pioneered new thinking in sustainable, high quality residential and cost-rental approaches. 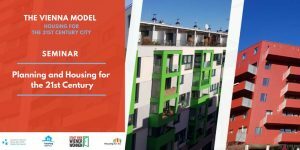 The city of Vienna has achieved extraordinary milestones in public housing: today, over 60% of the population lives in subsidized housing, and the city itself owns 220,000 rental units―about 25% of the total housing stock. Another 200,000 affordable housing units are owned by limited-profit housing associations. The city is clearly in control of the housing market. Dublin City Council’s free exhibition runs in various places until 25th April. SPEAKER: Prof. William Hynes (Director, Future Analytics Consulting). RESPONDENT: Prof. Kenneth Gibb (Director, UK Collaborative Centre for Housing Evidence, Professor in Housing Economics, Glasgow University). SPEAKERS: Ms. Michaela Kauer (Director, Vienna House, Brussels), Dr. Rory O’Donnell (Director, NESC), Ms. Grainia Long (Commissioner for Resilience, Belfast City Council). PANELLISTS: Mr John Coleman (CEO, Land Development Agency) Mr. Cormac Murphy (CEO, European Investment Bank (Ire)), Mr. David Joyce (Solicitor and Board Member, Irish Human Rights and Equality Commission), Dr. Bernie O’Donoghue-Hynes (Research Executive, LGMA). Ms. Úna Ní Dhubhghaill (Principal Officer, Office for Promotion of Migrant Integration).